August 1, 2011 - A 47-year-old man pleaded guilty on Thursday to a violation of the Arms Export Control Act following a U.S. Immigration and Customs Enforcement's (ICE's) Office of Homeland Security Investigations (HSI) investigation. According to the plea agreement, Henson Chua, of Manila, Philippines, knowingly and willfully caused the temporary import into the United States an RQ-11B "Raven" Unmanned Aerial Vehicle (UAV) from the Philippines into the U.S. The RQ-11 Raven was originally introduced as the FQM-151 in 1999, but in 2002 developed into its current form. The craft is launched by hand and powered by an electric motor. The plane can fly up to 6.2 miles at up to altitudes of 10,000 feet above ground level (AGL), and 15,000 feet mean sea level (MSL), at flying speeds of 28-60 mph. A single Raven costs about $35,000 and the total system costs $250,000. The RQ-11B Raven UAV weighs about 4.2 lb, has a flight endurance of 60?90 minutes. Chua initially listed the item for sale on eBay and then engaged in communications with undercover agents from ICE HSI, which culminated in the recovery of the item by U.S. officials. In May 2010, after viewing nine photos on Ebay the Pentagon informed federal investigations that one of its drones was being auctioned off on Ebay for $13,000. The photos viewed indicated the drone had been manufactured here in the United States. Chua had been indicted and charged by a grand jury in Tampa back in March for violating the Arms Export Control Act. U.S. law forbids people from buying and selling defense equipment without authorization from the U.S. government. The RQ-11 Raven is listed on the U.S. munitions list as a defense military hardware. The Department of Homeland Security purchased the drone from Chua by pretending to be a business man and purchasing for a Russian buyer. The drone purchase was eventually traced back to Chua. Chua faces a maximum sentence of 20 years in prison. A sentencing date has not yet been set. The Raven RQ-11B UAV system is manufactured by AeroVironment. 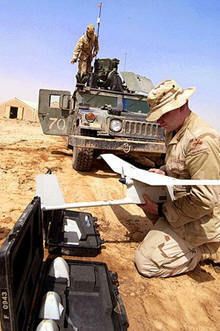 It was the winner of the US Army's SUAV program in 2005, and went into Full-Rate Production (FRP) in 2006. Shortly afterwards, it was also adopted by USSOCOM, the US Marines, and the US Air Force for their ongoing FPASS Program. It has also been adopted by the military forces of many other countries. More than 13,000 Raven airframes have been delivered to customers worldwide to date. A new Digital Data Link-enabled version of Raven now in production for US Forces has improved endurance, among many other improvements. The Raven can be either remotely controlled from the ground station or fly completely autonomous missions using GPS waypoint navigation. The UAV can be ordered to immediately return to its launch point simply by pressing a single command button. Standard mission payloads include CCD color video cameras and an infrared night vision camera. "The unlawful import of military technology poses a serious threat to our national security," said Susan McCormick, special agent in charge of ICE HSI in Tampa. "ICE is committed to working with the U.S. Attorney's Office and military investigators to protect the American public and our military troops overseas from this kind of technology falling into the wrong hands."